Do you have a blog, particularly a book blog? Time to tune it up and get energized by participating in the Spring 2017 Bloggiesta running from March 20-26. Sign-ups are here. Bloggiesta is an online party where you can get your blog organized, take challenges to learn new things, and — best of all — meet some awesome book bloggers! Look into the new features of the latest WordPress system and try to incorporate at least one into my Roberta Gibson Writes website. Write and post a better author bio. Help! It’s at the top under “About Roberta.” It’s massive and boring. I’m thinking about making the beginning more personal and breaking up each section into its own page with links to them. Would anyone click through the links, do you think? Suggestions? Thanks to Crimson at Crimson Blogs About Books for some great suggestions. Prepare for Poetry month in April by writing and scheduling three or four appropriate posts. Prepare a wrap-up post for Sunday. I’ve been neglecting those. The Sunday Post meme is a great way to catch up with other book bloggers. Wish I had time to read every one. Cross-post some reviews to GoodReads, etc. -Wait there’s a challenge at Blame It On the Books to do even more. I’ll have to try that one. Check out the Spring 2017 challenges for more ideas. Time to get busy. Hope you all have a fun and productive Bloggiesta. I’d rather have a root canal than write a bio. Great list! I also like the logo you made to personalize Bloggiesta. Thanks for sharing, have fun, and I’m glad you could visit my blog. Wonderful list, hope you have a great time with Bloggiesta! 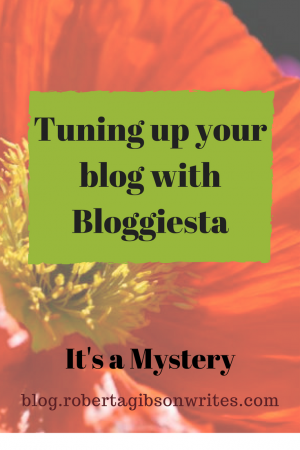 It’s always good to make time for Bloggiesta. I re-did my bio during the last Bloggiesta. I shortened it and added one thing. I’ll have to go see how you did your bio. your contact section and review policy could be different pages (i’ve usually seen them as separate) maybe the section where you mention other places you blog at can be under your ‘about me’ section (w the personal stuff). the other things like ‘writer’ and ‘scientist and teacher’ i’d put under their own page, maybe a publications section? Wow, thank you for the great suggestions. Having contact and review policies on separate pages makes so much sense. Plus, those two should be on the blog rather than the website. Since I’ve never like my own blog posts, I never noticed there wasn’t a button. I thought WordPress took care of it. Yikes, I’ve got some work to do! For those of you with WordPress blogs, the “Like Post” feature is in JetPak. The default is for it to be turned off.